We wish to welcome anyone in need of veterinary care to our small but mighty practice. Dr. Toles would love to meet your new pet (as would the rest of us). Call our office with questions or click here to make an appointment. Is your pet at risk of Lyme disease? If you live in Niagara and your dog ever goes to parks, then YES! Luckily There are vaccines that can prevent the disease from infecting your dog (and preventatives that will protect your dog from being exposed). 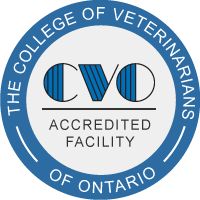 Dr. Toles has a passion for dermatology (the study of skin and its diseases) and is a member of the Canadian Academy of Veterinary Dermatology. Animal Health Services has access to referral services. Did you know that there are veterinary: dentists, opthalmologists, dermatologists, cardiologists, neurologists, oncologists, orthopedic surgeons, to name but a few? These specialists can provide cat scans, MRIs, ultrasound, endoscopy and more.